Hallooo!!! I know, I know—this is a super late post! But as promised, ito na talaga! Since it was an extraordinary birthday, I racked my brains on how to make my husband feel special on his birthday. I can’t think of any gifts—he usually buys what he wants right away (well, not exactly right away…he’d first research about that item, and sometimes even create a comparative chart). But not this time; there was something he wanted so badly, yet haven’t bought it because of guilt: a laptop. See, ever since his Macbook Pro got stolen, he had not bought a new laptop. He thinks that his laptop was stolen because of his carelessness, and he deserves the punishment of not having a new laptop. But oh how badly he wanted a new one. So, EUREKA! Alam ko na ano’ng gift sa kanya! Since I knew he would not be happy with just any laptop, I sought the help of our friend Irvin. So I thought, OK na ‘to. Randy does not really like parties so I decided that there’ll be no parties for him. But two weeks before Randy’s birthday was Yaya Isay’s birthday. Aaand, hindi ko kinaya ang handa ni Isay (from her own pocket)! Bonggacious ang handa niya, may shrimps pa! Basta if you were there on her birthday you’d think CEO namin si Isay! And then I realized Randy probably have never had a bonggels birthday celebration all his life, and his birthday this year is the best time for it. I talked to Irvin that night and he agreed that Randy deserved a party. The following day, I started to work. Alam n’yo naman ako ‘pag dating sa pag-o-organize ng parties, OC. I was a nervous wreck! I hated the fact that I can’t DIY because: one, I only have two weeks; and two, mahahalata ni Randy. So my first mission was to book a caterer that also does event-styling. Second, I had to make sure that Randy’s friends could come, and that they’d also keep it a secret. It was a good thing that I was surrounded by people who also loved Randy—they surely helped me big-time with the planning and all. I constantly bugged Irvin with my worries—sanay kasi ako na shine-share lahat kay Randy. But this was something I had to keep a secret. There were countless times I almost shared my party-planning gripes to him! By the way, the theme that easily came to mind was basketball themed party for adult (Miami Heat & LeBron James, specifically), since it’s no secret that Randy is crazy about NBA, especially of LeBron James. The plan was that on Randy’s birthday, I’d bring him to Bellevue in Alabang to have buffet lunch. ‘Yun na kunwari ang birthday celebration n’ya. Meanwhile, the catering and my minions would be preparing for his party. Venue ay ang lawn lang namin. And then when we go home, SURPRISE!!! The day before Randy’s birthday, Irvin and I were in Quezon City, teaching Intensive ACET and DLSU-CET Review. Irvin brought Randy’s laptop (which he bought the night before at the Sony Centre in Glorietta). It was raining so hard that I started becoming nervous. Nevertheless, I still worked on Randy’s party when it was Irvin’s turn to lecture—I cut out the Randified LeBron James and plotted how to make it stand. We even had out students greet Randy a “Happy Birthday!” on video. Spot the Randified LeBron James! The entire night of August 18, I was both happy and nervous about the rains. Nervous, because what if it goes on until the next day?!? Happy, because the downpour was so heavy that I thought inuubos na ng langit lahat ng iluluha n’ya. After all, hindi naman unli ang ulan ‘di ba? But boy was I wrong!!! The following morning, I woke up early to the sound of loud raindrops. I don’t usually watch the morning news but I did on this day. Apparently, bumabaha na pala! Passion Cooks, the caterer from Paranaque I booked called me and asked whether we would push through. I consulted my cohorts and after much thought and disappointment we decided not to push through. 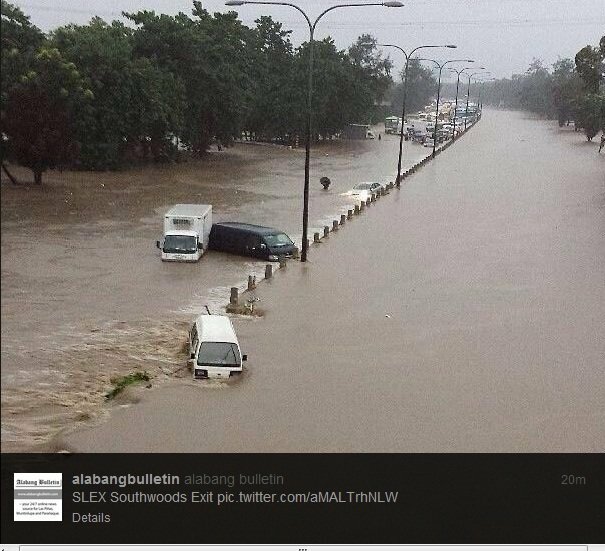 After all, I don’t think Randy would risk driving to Alabang. Ergo, hindi ko rin s’ya mapapaalis sa bahay. So no choice, bukas na lang. Because of that, I quickly texted all guests and other suppliers about the change of plans. I also cooked spaghetti, cake and lechon kawali impromptu kasi kawawa naman asawa ko na walang kahanda–handa! He texted his friends for an inuman session that night but almost none replied. Ayun na, nagsentimiyento na. He called Janno, the sole person who replied, and expressed his asar. Janno called me up and said he can’t bear not to go to Randy that night, kawawa na raw. I relented but warned him not to get drunk lest he’d spill the beans. At eto pang isang kamalasan! When I gave Randy his new laptop, nakow! Instead of being happy, sumimangot: iba na raw ang gusto n’yang laptop! I told him that that was the laptop he told Irvin that he wanted. He said he had changed his mind since then. S’yempre nag-pout-pout ako. I saw him feign excitement. He said he might like it anyway. Buuuuut, upon inspecting the laptop, ayun nanaman: marami raw gasgas! If you know Randy, allergic ‘yan sa gasgas. Ang mga gasgas na invisible to the naked eye of an ordinary human, very visible kay Randy! In the afternoon, my cohorts (all were Brain Train teachers) and I met. We were planning what to do the following day. We were cooped in one room and when Randy joined us we became silent. Then they ate Randy’s handa. I guess we all got caught up about being secretive that they did not even greet Randy! At ayun, mas lalong na-depress ang lolo n’yo! I so wanted to spill but I thought, Bukas, luluhod ang mga tala. Choz! Hehe. And wait again, there’s even more! The following day, Tuesday, que horor! Mukhang naka-unli talaga ang langit! All the more pa ang buhos ng ulan at mas lalong bumaha!!! Maja Martinez of Passion Cooks called me and said that their truck can’t travel as water was already seeping inside! At first I did not want to relent and insisted that the party push through but really, there was nothing they could do! So I texted the other suppliers and guests again. We decided to hold the party on Thursday na lang. I thought siguro naman wala na talagang iluluha ang langit ‘di ba? We had classes on Wednesday (twas a holiday), and Randy contacted Sony to have his laptop replaced…actually, upgraded pa nga. It took the Sony SA a looooooong time to agree to have the laptop upgraded. Sony said we should go to Glorietta the following day na agad to get a different laptop unit. Perfect, right? That means we have to leave the following day! But guess what? There’s more na more pang kamalasan! On Thursday, there was still drizzle but there were no more floods. I woke up early and left last-minute instructions to our people and my surprise party cohorts. Just as Randy and I were leaving, we asked each other where the receipt of the laptop to be replaced was. He thought I had it; I thought he had it! Naku na!!! I swear hinalughog na namin ang buong bahay looking for it but nada! Practically everyone looked for that small, valuable piece of paper but to no avail. We looked for that receipt for hours and hours, wala! Daig pa namin ang NBI agents na naghahanap ng hidden drugs! I convinced Randy to take chances—I told him to proceed and pretend to have left the receipt when we get to Sony. He reluctantly agreed, but on our way in the car we called Sony to say we do not have the receipt. The sales guy said we won’t be able to get a replacement if we don’t have it. So Randy drove back and I was hyperventilating!!! I texted the people back home we were headed back and to stop any activity related to Randy’s party. Naiiyak na talaga ako!!! I was on the verge of spilling my guts out.